Meizu M6T was announced in June 2018 and been released a few days later in June 2018. The smartphone flaunts 5.7″ of IPS LCD capacitive screen at a resolution of 720 x 1440 pixels and 18:9 aspect ratio. The device is measured around 152.3 x 73 x 8.4 mm in dimensions and weighs around 145 g. Its display has ~282 PPI density and uses its own built UI named “Flyme UI”. Regarding the cameras, Meizu M6T has a dual 13 Megapixels +20 Megapixels camera with the f/2.2 aperture length and houses a PDAF technology which helps cameras to focus fast while it has 8 MP front camera f/2.0 aperture length and equipped with a depth sensor. The rear camera comes with the video resolution of 1080p@30fps. The smartphone is powered by the MediaTek MT6750 chipset, octa-core processor, and Mali-T860MP2 GPU. It has 4GB of RAM for 64 GB of Internal memory while 3 GB of RAM for 32 GB of Internal memory. Further, the memory is expandable up 128 GB via microSD card uses Sim Slot 2. As far as the battery is taken into consideration, the smartphone fits the budget so far and with 3300 mah Li-ion battery capacity, the device is quite up to the mark. This product is available at Gearbest. 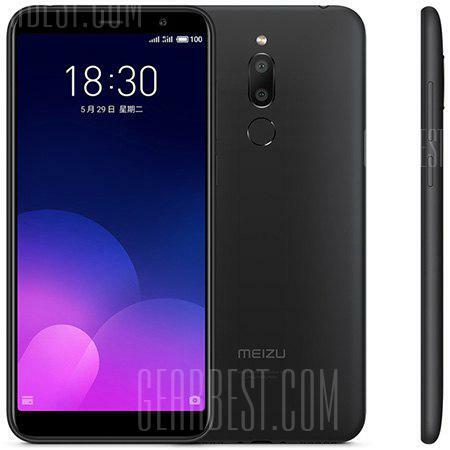 The lowest price of MEIZU M6T 4G Phablet Global Edition was obtained on April 24, 2019 2:10 pm.